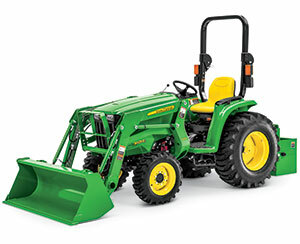 John Deere expanded its 3E Series and 2R Series compact utility tractor lines. The new 3E series now includes the 25-hp 3025E model, while the 2R Series added the 38-hp 2032R and 2038R models. The 3025E model features a two-range hydrostatic transmission and Twin Touch foot controls. The optional iMatch Quick-Hitch provides easy rear implement hookup in seconds, while operators stay seated, allowing them to quickly move on to the task at hand, John Deere said. Each compact utility tractor is compatible with the John Deere Service Advisor system, allowing for extensive self-diagnostic capabilities. The wide tractor stance and longer wheelbase of the 2032R and 2038R, combined with increased tractor weight, improve stability when navigating a variety of different terrains. Additionally, the 2R Series compact utility tractors are equipped with standard work lights on the fender, an optional LED work light kit, suspension seat, ergonomic controls, tilt steering wheel, cruise control and thick rubber floor mat. The 2R Series tractors feature the CommandCut lift system to make cutting height adjustments, the Twin Touch foot controls and the eThrottle feature, which allows the machine to automatically increase or decrease engine speed. AutoConnect mid-mount mower decks provide easy attaching and detaching, and the quick-attach backhoe allows for installation without removing the three-point hitch draft arms. Additionally, the larger implement options from the 3R tractors are now available for the 2R series models. Standard service indicators alert the operator of maintenance needs, such as when the air filter needs to be cleaned or replaced. Onboard diagnostics and Service Advisor connectivity allow technicians to quickly and easily monitor machine health, John Deere said.